This list is arranged by form Style, for example, a Continuous Form is a fan-fold stack of forms used in a dot matrix computer printer. 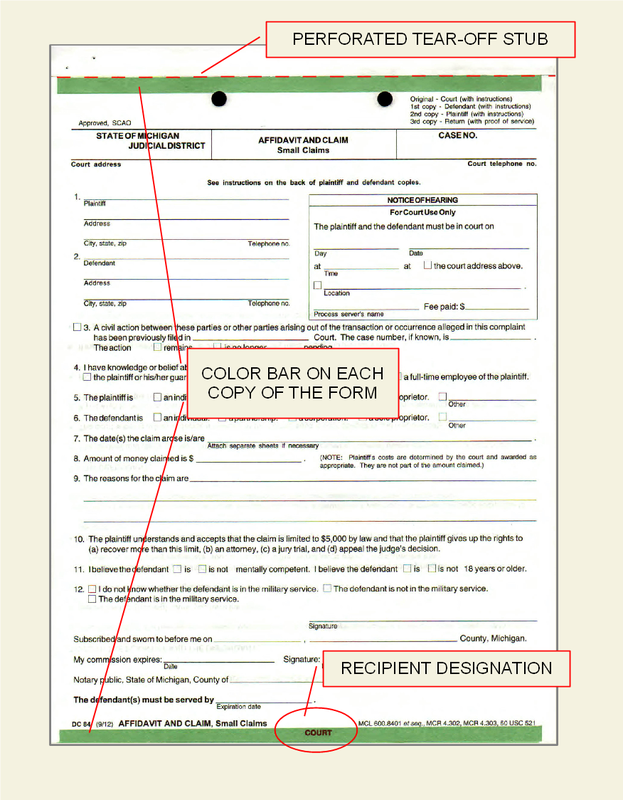 As such, you would not order the Continuous Style if you are filing in your forms by hand. Other Popular Items that may interest you, select an item below! Use the link below to access your account. FAN-A-PART Forms, also referred to as multi-part or carbonless forms, are made up of multiple sheets of different colored paper which are glued together at the top of the form for easy separation and distribution. This style of form is primarily used for filing out by hand but also works well in a typewriter. The Snap Set Form is made of single color stock and features color bars at the top and bottom of each page with a descriptor line designating the recipient of each copy. Snap Set Forms are similar to the Fan-A-Part Form but they have a tear-off stub at the top of the form. The State Court Administrative Office (SCAO) is the administrative agency of the Michigan Supreme Court. Article VI, Section 3 of the Michigan Constitution states that the Michigan Supreme Court "shall appoint an administrator of the courts and other assistants of the supreme court as may be necessary to aid in the administration of the courts of this state." The Supreme Court has administrative oversight of Michigan's courts and exercises that oversight through the SCAO. The Trial Court Services Division of the State Court Administrative Office is responsible for developing, revising, approving, and distributing court forms. Click here for more information about SCAO.